that sweet puppy in the pet store window came from a puppy mill? that little white dog you think is a Coton may only be a "mix" of white dogs that look like a Coton? There are 3,500 pet stores in the United States that sell puppies. Approximately 500,000 thousand puppies a year are sold in pet stores. ALMOST 100% OF THE PUPPIES SOLD IN PET STORES COME FROM PUPPY MILLS! Puppy mills have the most shameful of distinctions because of their inhumane conditions. Millers constantly breed unhealthy and genetically defective dogs with one thing in mind…PROFIT!!! Unsuspecting families often buy puppies that are ill or have genetic or emotional problems. Almost 100% will have parasites when they’re purchased. Many have parvovirus. Many of these puppies bred in horrendous puppy mill conditions die from the diseases they acquire there. Just as many have medical problems that will cost you thousands and thousands of dollars over the lifetime of the dog. 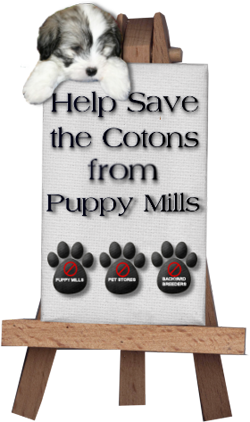 Puppies from mills suffer extreme emotional problems due to lack of human care and socialization. If there is a puppy in your future, or if you know someone who is planning to buy a puppy, please read all the information on this site. Learn about the differences between responsible breeders and backyard breeders. Know where pet store puppies come from. Pass along what you have hopefully learned here and tell everyone you know not to buy a puppy from a pet store. You too can make a difference in the lives of helpless animals! Learn how to put unscrupulous backyard breeders and puppy mills out of the business of abuse for profit! YOU CAN END THIS CYCLE OF MISERY! NEVER BUY A DOG FROM A PET STORE!